When a new session is started, this will control whether the DHT engine is also started automatically. 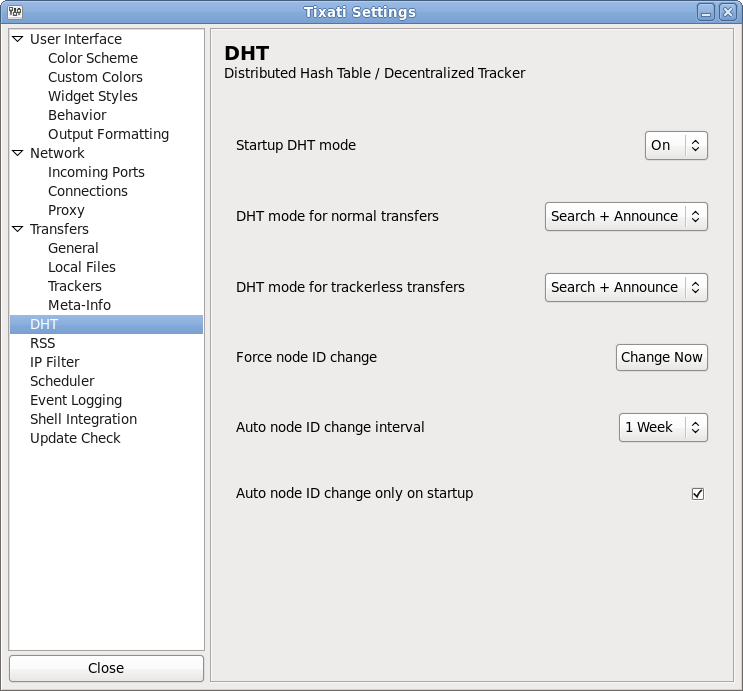 This controls whether DHT will search for peers in transfers that have at least one tracker. This controls whether DHT will search for peers in transfers with no trackers. This will cause an immediate node ID change, which will reset the node table. This may be done for privacy purposes. This may disrupt any searches that are currently running. For privacy reasons, it is a good idea to change your DHT Node-ID about once per week. This option will do it automatically on an interval you select. This causes automatic node ID changes to happen only on program startup. This is a good idea because changing a node ID when search operations are happening can lead to less than optimal results on those searches and will also cause some delay if the node table is being rebuilt.